PPC Town understands that most businesses will target a specific demographic, in certain areas. What the big question is, are you sure you are including ALL of the potential customers? We have seen many advertisements by others that completely ignore the Spanish-speaking population when targeting certain areas where there is a big presence. Digital marketing these days is nothing like it has been in the past few years, let alone the past few months. The commercial space is constantly evolving and getting more competitive so that means that many of these “guarantees” for placement or “x” amount of leads seems more hollow. Google, for instance, has said that any business that is guaranteeing first page results for an organic listing is misleading clients or up to some black hat SEO techniques. Either way, it’s probably not a company you want to do business with for the short or long term. In the world of Digital Marketing, there is no “one-and-done” for advertising businesses that are in it for the long haul. Advertising a business from the beginning is like aging Bourbon (but not nearly as long). The advertising matures over time, and our PPC Town Gurus are all over adjusting the accounts to make sure they are running at an optimum level for your business. While from the beginning your accounts will achieve success, they will continue to see success over time as the accounts are trimmed to perfection. With Digital Marketing, there is no reason to limit yourself to one avenue of advertising your business. You can do online advertising with the likes of Google AdWords, Bing Ads and then also put in Facebook Advertising and LinkedIn Advertising as well. Being able to market to different areas of the Internet will not only increase your reach, but yield better results over time because not all businesses are the same. In some cases, Facebook Advertising versus Google AdWords may be the way to go for example. Remember Email Campaigns? Yes, they still are around and a great way to drive sales into a customer’s inbox. 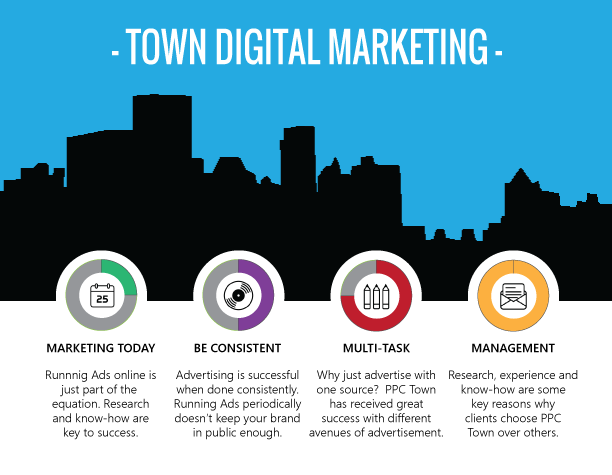 PPC Town has many talented townsfolk that are in it for the long haul with your business, so we’ll admit that there are many other agencies out there that do what we do. Our group of professionals at PPC Town strive to listen to our client’s needs and drive home a personalized solution for each client. This means that every solution delivered is custom-tailored to the client and we’ll be around to see it through.